Durham Region, ON (November 29, 2016) – Spark Innovation Centre is pleased to announce the appointment of Sherry Colbourne as the organization’s new President and Chief Executive Officer (CEO), effective January 3, 2017. Sherry is a Canadian entrepreneur who has recently returned to Ontario from a four-year entrepreneurial sabbatical in the Middle East. During her time there she co-founded Startup Oman, which has become the hub of Oman’s entrepreneurial ecosystem, focused specifically on high-impact entrepreneurs. Prior to founding Startup Oman, Sherry was co-founder and CEO of Ladybug Teknologies, a social technology company that developed innovative breath-screening solutions. Sherry’s energy and love of technology was seeded early in her 25-year career in the Canadian high tech sector where she worked for some of Canada’s leading technology innovators including Leigh Instruments, Com Dev, Diemaco, DspFactory and Certicom. “I am delighted to be joining Spark Centre and to become part of the continued progress it is making throughout Durham Region in fostering entrepreneurial innovation,” said Sherry Colbourne. We are very excited to welcome a panel of representatives from four different organizations to highlight some of the funding available to entrepreneurs in Ontario! This workshop is a great opportunity for you to learn about the various funding available and how to apply. It is also a networking opportunity for you to connect with the representatives from these organizations. 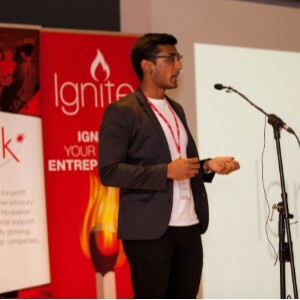 Spark Innovation Centre is pleased to announce Dash MD as the Young Entrepreneur winner and Hexyoo Scientific as the General Entrepreneur winner of the 2016 Ignite Competition. Both companies have taken the top prize of $25,000 each. Dash MD are the creators of a mobile app that helps patients track, manage, and find the care they need once they’ve left the hospital. Their goal is to provide patients with the tools and resources they need to successfully traverse their road to recovery. Hexyoo Scientific are the creators of a proprietary gel based pressure ulcer pad for use in a hospital setting. The gel pad, placed over a mattress has embedded sensors to help healthcare providers with the treatment and prevention of pressure ulcers. Along with the $25,000 prize, these two companies will be given free office space in Spark Centre’s head office The Loft, located in Oshawa, and will also join Spark Centre’s Thrive Accelerator Program which offers significant advisory and business support services to achieve a faster market entry. Spark Centre is looking for two part-time positions to join our marketing department. Please click the links below for more details and to apply. This workshop will go over how to set up the internal financial reporting structure of your business and stay on top of your corporate filing requirements. From the initial opening of the company bank account, set up of internal controls to filing your corporate tax returns, this will be an open forum to answer questions you have as to how to best structure the backbone of your business. At Ultima Apparel, we aim to provide gym goers and anyone alike with attractive, comfortable compression apparel that tracks form and posture to avoid injury during intensive workouts. Our goal is to help anyone new to fitness, or a seasoned athlete track their form and technique with the use of sensors and elastic fabric materials during physical training. Injuries while exercising is very common, and is due to incorrect exercise habits, especially bad form. Our products will immediately warn gym-goers of unforeseen injuries that could be detrimental in the shortcoming or in the long run. We strive to be a leader in injury prevention for fitness training and eventually the workplace. In the upcoming years, our hope is to also have several of our products in the hands of our valued customers with thegoal of becoming a direct alternative to trainers or coaches in the areas of posture and technique tracking. With the funding we can continue to develop our product at a much faster rate than before while having the means to establish a basis of our company. The Ignite funds have accelerated our product development as it is quite challenging to generate our own funding being students. The Ignite competition has opened our eyes, as young entrepreneurs, to the importance of pitching and networking. Due to our success in the student category at Ignite, we have some motivation that further strengthens our zeal to pursue our goals and aspirations. One of the other things that Ignite and Spark Centre has exposed us to are the very generous and inspiring people they are involved with it. Many entrepreneurs are stretching out their hands, reaching out to us in ways that are very advantageous to our success. Ignite also has the expertise that we as student entrepreneurs need to see things through without salvaging and wasting time looking for the right mentors.